Probiotics are essential to gut healing. You can go with supplements or fermented foods like sauerkraut, kombucha , kefir, kimchi, or pickles. For most people, supplements are the easier option but ferments offer a lot more effectiveness and they are much cheaper. For example, a month of one of the top probiotic supplements costs around $40. To make a jar of sauerkraut at home that would last at least a week, it would be less than $5. One holistic doctor did a test on his homemade sauerkraut and found out that one serving of the kraut had more beneficial bacteria than a whole bottle of probiotics. Fermented foods are also full of nutrients- many have high vitamin C content as well as B vitamins. When it comes to getting more bang for your buck, fermenting is the way to go! Fermentation is the process when microorganisms feed on the starch and sugar in food and they turn them into lactic acid. This is called lacto-fermentation. There are a few kinds of fermentation, but the lacto-fermenting the one that gives the most health benefits. Fermentation is the metabolic breakdown of a nutrient without using oxygen. Ethanol, acids, gases, and other molecules are produced in this breakdown. So lacto-fermentation creates enzymes, vitamins, beneficial bacteria and probiotics. Another benefit to fermenting is that it helps increase the shelf life of food! There are many ways to ferment foods. The most common things you can try to make are milk kefir, water kefir, kombucha , yogurt, and fermented vegetables. Cultures for Health is a great website to find cultures for these foods. Veggies usually only need a salt water brine to successfully ferment. There are hundreds of websites and books for ideas on how to make and flavor these foods to make them delicious. Kefir is one of the easiest ferments to make. You can make it with sugar water or milk. Mason jars are great for making kefirs. Both need “grains” to start them off. They are called grains because of what they look like when they are rehydrated- they are not truly grains. Water kefir uses sugar, filtered water (fluoride free is best- there are a few filters like Tapmaster and Berkey that filter out fluoride), and the grains to get started. The sugar needs to be dissolved in warm water first. Once the water is cooled down, you can add the grains. Cover with a coffee filter or cheesecloth and use a rubber band to keep it in place. Then it sits for about 24 hours to ferment-easy! You can also make a second ferment to flavor it using fruit, herbs, or even ginger. Milk kefir is even easier- it just requires the cultures and milk, preferably organic, grass-fed and without synthetic vitamin D added. Cover the jar the same as you would water kefir, and let sit for 24 hours. These are 2 of the easiest ways to get more probiotics in your diet and to get accustomed to fermented foods. Pickles are one of the easiest ferments to make, and they are my personal favorite. I go through pickles like it’s nobody’s business. 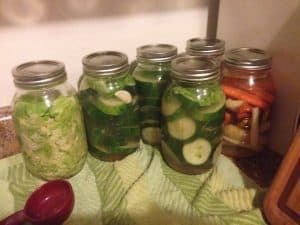 I can’t remember where I found the original recipe for pickles, and there are many variations (see my fermented goodness Pinterest board below for more ideas). I usually use about 3 cucumbers for my pickles, which gets me about 2-3 Mason jars of pickles (depending on the size of the cucumber- Costco has big cucumbers in a 3 pack, which is what I usually use.) I usually get a cabbage as well to make kraut, and I use the top cabbage leaves to push down the pickles in the jar (but you can use something like a Pickle Pipe or even fermentation weights!). I cut the cucumbers into little slices (like pickles for burgers since we make our own buns and burgers) and put them in an ice bath for a few hours ( this trick keeps the pickles crunchy- you can use grape leaves in the ferment to help with that as well, but I’ve never seen grape leaves locally where I’ve lived). After their refreshing ice bath, I add them to a salt water brine. I add 1 Tablespoon of Himalayan Pink salt to a quart mason jar, fill with about 2 cups of water, and stir until most of the salt is dissolved. Then I add enough cucumbers to almost fill the jar, pop in 1-2 garlic cloves, and put the cabbage leaf over it to push the cucumbers down in the brine. I usually burp the jar several times over the first few days, and let them sit for about 7 days. Put them in the fridge to chill a bit, and then enjoy! I tend to drink the pickle juice as I go as well. My most recent batch of ferments. Rainbow carrots, Pickles, and sauerkraut. 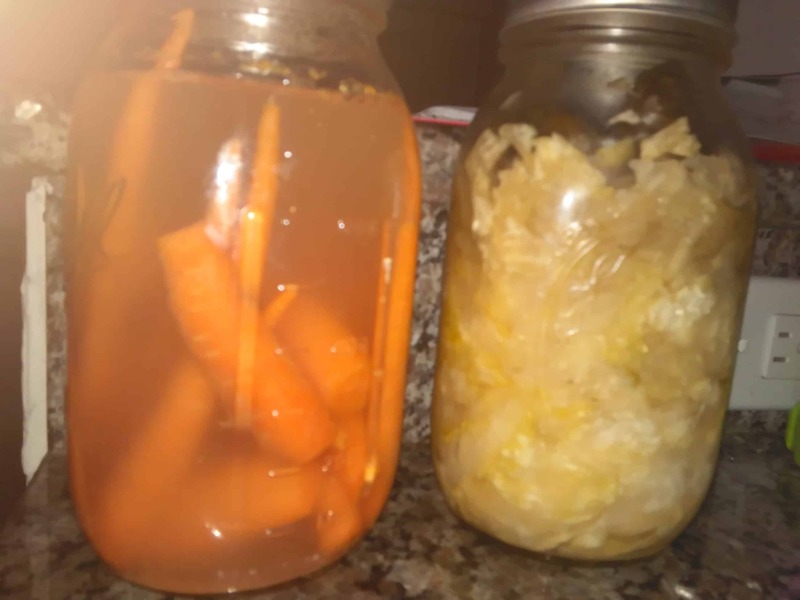 This is the first ferments I ever made. I wanted to start small and easy, and this was the perfect one. I got the recipe here and I’ve pretty much stuck to it since, but I made my own alterations. My son has LOVED these! He could eat a whole jar in a day. The garlic is essential to make it taste delicious. Peel 2-3 garlic cloves and add them to the jar of salt water. Add the trimmed carrots to the jar vertically. You want them packed in tightly but also comfortable enough so that all of the brine covers them. Add more water to the jar if needed, enough to cover the carrots. You can also put a cabbage leaf over the carrots to keep them in the brine but I find that it’s not really necessary. Put the lid on and let it sit for about 7 days. In warmer climates, it will ferment faster and since we are moving into summer be aware of that. The first 3 or 4 days you WILL have to burp the jar- meaning just untwist it so you can hear the gas release. You don’t want that gas to build up because the jar can explode- believe me, I have lost a few jars that way! After 6 or 7 days you can taste test the carrots. They should taste tangy- if this is the first ferment you have ever made it might take some getting used to the flavor. Once they seem done to you, you can store them in the fridge to stop the fermentation process. See, easy peasy! If not, trust me- they are the easiest things to make and very kid-friendly! This is obviously one of the most popular ferments out there. Admittedly, it took me quite a while to figure out the “how” behind it. My first few batches were horrible! But now I figured out the trick to making it just right. Buy 1-2 medium size cabbages (cabbage is on the dirty dozen list so it’s better organic, or check local farmers markets- I get mine for $2 a head!). The amount of cabbage you use will depend on the size jar(s) you have. Peel off the outer green layers and save them for now. Cut the cabbages into quarters and cut the core out. You can use a sharp knife, a food processor with a slicing blade or a mandolin to very thinly slice the cabbage. Add about half of the sliced cabbage to a big bowl and add about 1/2- 1 tablespoon of salt (again, depends on the size of your jar). Mix the cabbage a bit, and add remaining cabbage. Add another 1/2 tablespoon- 1 tablespoon of salt and mix. Cover the bowl with a light hand towel and let it sit. Now most sources say let it sit for 2 hours. I let it sit for at least 6. This gets ALL of the liquid out of the cabbage and makes creating the brine very easy. After you let it sit for several hours, get ready to pack it into your jars (or fermenting crock!). You have to put a little bit of cabbage in at a time so you can pack it in and kind of mush all of the liquid out. This method creates the brine for the cabbage. I use the opposite end of a potato masher, but they actually have real tools specific for this job (called cabbage crushers or kraut pounders, lol!). You can also add things like raw ginger or garlic to these once you are done pounding. Once you have all of your cabbage pounded into the jars, you can break off a piece of the green cabbage leaves you have saved and use them to push the cabbage down into the brine. This helps prevent any mold issues and keeps all of the cabbage happy in the brine. Depending on climate, you can let this sit for anywhere from a few weeks to a few months. The average time seems to be about 3 weeks. You’ll want to burp the jar a bit over the first week or so just to prevent explosions. Once your kraut tastes good to you, you can store it in the fridge to slow the fermentation process. And then enjoy! Start with a small amount each day though, no more than a tablespoon. You can initiate some crazy healing with real probiotics! For more fermenting ideas, check out my Pinterest board Fermented Goodness! There are so many different options out there for fermenting!